The 2 Bottle Nitrogen Cart is a small, lightweight, towable source of nitrogen gas for servicing tires, struts, accumulators, and other gaseous nitrogen needs. The standard cart is equipped with both high pressure (0-5000 psig) and low pressure (0-400 psig) servicing systems. Each system has a service gauge, regulator, and service hose. The bottle cart comes equipped to mount two 3600 psi receivers. 2,200, 4,500, 6,000, and 10,000 psi receiver mountings are available as options. Other options include a Booster System, Self-Fill Option, and Air Drive Option. The Booster System Option adds an air-driven gas booster to the bottle cart, which uses gas from the receivers to boost the nitrogen gas to high pressure. Even with receiver pressures as low as 500 psig, the cart can still deliver high pressure gas up to 5000 psig. The Booster System option is available with many different booster ratios, which can deliver pressures as high as 10,000 psig. The Self-Fill Option is only available with the Booster System. It allows filling of the on-board receivers from a low pressure nitrogen source, without removal, using the booster to do the work. The Air-Drive Option, which is also only available with the Booster System, allows the booster to be driven from an external low pressure air source, which conserves the nitrogen in the receivers. The 2 Bottle Nitrogen Cart is a small, lightweight, towable source of nitrogen gas for servicing tires, struts, accumulators, and other gaseous nitrogen needs. The standard cart is equipped with both high pressure (0-3600 psig) and low pressure (0-400 psig) servicing systems. Each system has a service gauge, regulator, and service hose. The bottle cart comes standard with two 3600 psi receivers. 2,200, 4,500, 6,000, and 10,000 psi receivers are available as options. Other options include a Booster System, Self-Fill Option, and Air Drive Option. The Booster System Option adds an air-driven gas booster to the bottle cart, which uses gas from the receivers to boost the nitrogen gas to high pressure. Even with receiver pressures as low as 300 psig, the cart can still deliver high pressure gas up to 3600 psig. The Booster System option is available with many different booster ratios, which can deliver pressures as high as 10,000 psig. The Self-Fill Option is only available with the Booster System. It allows filling of the on-board receivers from a low pressure nitrogen source, without removal, using the booster to do the work. The Air-Drive Option, which is also only available with the Booster System, allows the booster to be driven from an external low pressure air source, which conserves the nitrogen in the receivers. 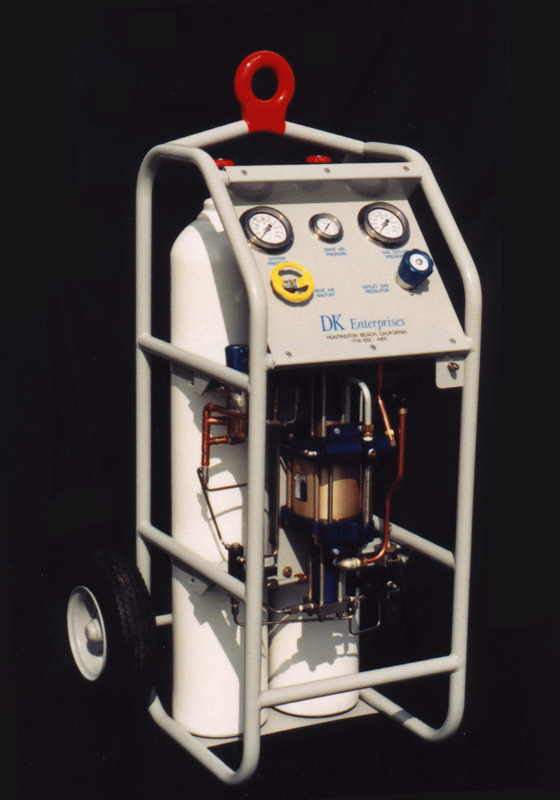 The 3 Bottle Nitrogen Cart is a rugged, towable source of nitrogen gas. The standard cart is equipped with a (0-5000 psig) servicing system. The servicing system has a service gauge, regulator, and service hose. The bottle cart comes standard equipped to mount three 3600 psi receivers. 4,500 and 6,000 psi receiver mountings are available as options. Other options include a Booster System and Self-Fill Option (patent-pending). The Booster System Option adds an air-driven gas booster to the bottle cart, which uses gas from the receivers to boost the nitrogen gas to high pressure. Even with receiver pressures as low as 500 psig, the cart can still deliver high pressure gas up to 5000 psig. The Booster System option is available with many different booster ratios, which can deliver pressures as high as 10,000 psig. The Self-Fill Option is only available with the Booster System. It allows filling of the on-board receivers from a low pressure nitrogen source, without removal, using the booster to do the work. The 4 Bottle Nitrogen Cart is a rugged, towable source of nitrogen gas. The standard cart is equipped with a (0-5000 psig) servicing system. The servicing system has a service gauge, regulator, and service hose. The bottle cart comes standard equipped to mount four 3600 psi receivers. 4,500 and 6,000 psi receiver mountings are available as options. Other options include a Booster System and Self-Fill Option (patent-pending). The Booster System Option adds an air-driven gas booster to the cart, which uses gas from the receivers to boost the nitrogen gas to high pressure. Even with receiver pressures as low as 500 psig, the bottle cart can still deliver high pressure gas up to 5000 psig. The Booster System option is available with many different booster ratios, which can deliver pressures as high as 10,000 psig. The Self-Fill Option is only available with the Booster System. It allows filling of the on-board receivers from a low pressure nitrogen source, without removal, using the booster to do the work. The 4 Bottle Nitrogen Cart is a rugged, towable source of nitrogen gas. The standard cart is equipped with a (0-3600 psig) servicing system. The servicing system has a service gauge, regulator, and service hose. The bottle cart comes standard equipped to mount four 3600 psi receivers. 4,500 and 6,000 psi receiver mountings are available as options. Other options include a Booster System and Self-Fill Option (patent-pending). The Booster System Option adds an air-driven gas booster to the bottle cart, which uses gas from the receivers to boost the nitrogen gas to high pressure. Even with receiver pressures as low as 500 psig, the cart can still deliver high pressure gas up to 3600 psig. The Booster System option is available with many different booster ratios, which can deliver pressures as high as 10,000 psig. The Self-Fill Option is only available with the Booster System. It allows filling of the on-board receivers from a low pressure nitrogen source, without removal, using the booster to do the work. 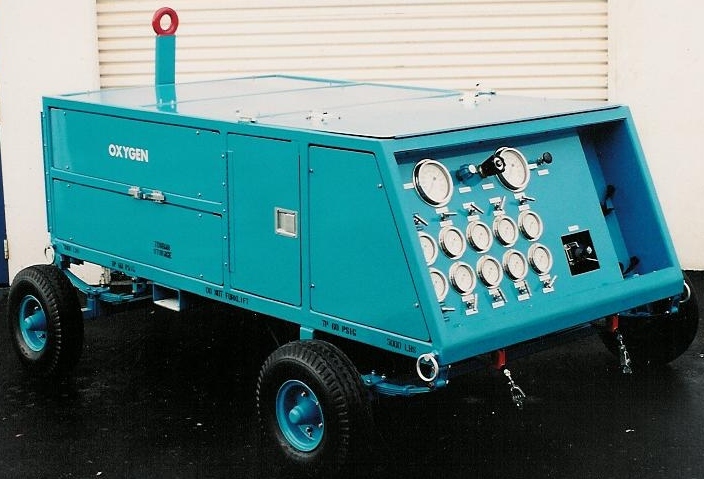 The 6 Bottle Nitrogen Cart is a rugged, towable source of nitrogen gas. The standard cart is equipped with both high pressure and low pressure servicing systems. Each servicing system is equipped with a service gauge, regulator, and service hose. The bottle cart comes standard with six 2400 psi receivers. 3,600 and 4,500 psi receivers are available as options. The on-board Booster System uses an air-driven gas booster, which uses gas from the receivers or an external low pressure source to boost the nitrogen high pressure. Even with receiver pressures as low as 300 psig, the cart can still deliver high pressure gas up to 4000 psig. A Self-Fill Option is available, which allows filling of the on-board receivers from a low pressure nitrogen source, without removal, using the booster to do the work. The 8 Bottle Nitrogen Cart is a towable source of nitrogen gas for servicing tires, struts, accumulators, and other gaseous nitrogen needs. The cart is equipped to service both high pressure (0-5000 psig) and low pressure (0-400 psig) servicing needs. The system has a two service gauges, a regulator, and service hose. The bottle cart comes equipped to mount eight 3600 psi receivers. 2200, 4500, 6000 and 10,000 psi receiver mountings are available as options. Other options include a Booster System, Self-Fill Option, Hose Reel, and Air Drive Option. 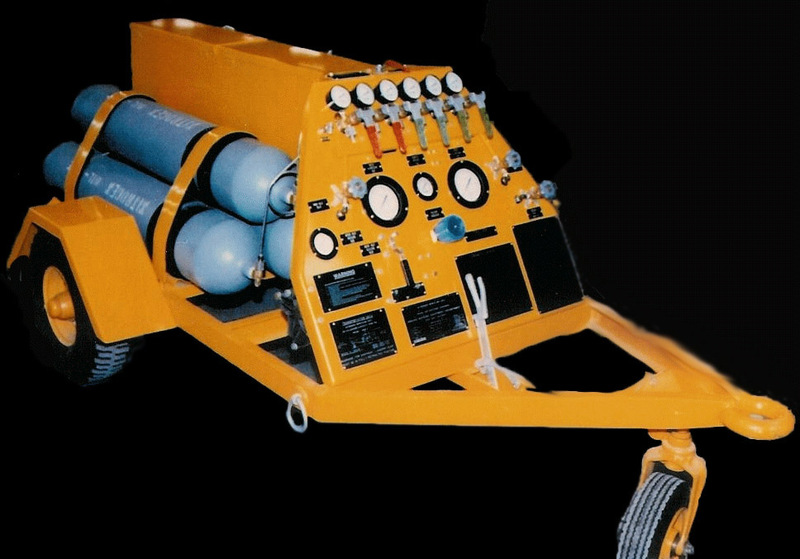 The Booster System Option adds an air-driven gas booster to the bottle cart, which uses gas from the receivers to boost the nitrogen gas to high pressure. Even with receiver pressures as low as 500 psig, the cart can still deliver high pressure gas to 5000 psig. The Booster System option is available with many different booster ratios which can deliver pressures as high as 10,000 psig. The Self-Fill Option is only available with the Booster System. It allows filling of the on-board receivers from a low pressure nitrogen source, without removal, using the booster to do the work. The Air-Drive Option, which is also only available with the Booster System, allows the booster to be driven from an external low pressure air source, which conserves the nitrogen in the receivers. 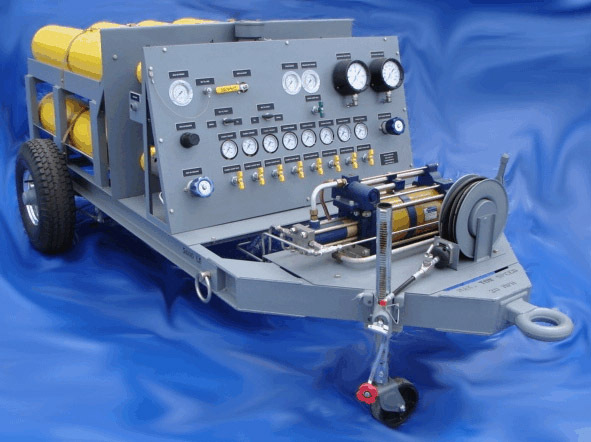 Built for the U.S. Air Force to Mil-T-26772F, the 8 Bottle Nitrogen Cart is a towable source of nitrogen gas for servicing tires, struts, accumulators, and other gaseous nitrogen needs. The cart is equipped to service both high pressure (0-3600 psig) and low pressure (0-400 psig) servicing needs. The system has a two service gauges, a regulator, and service hose. The bottle cart comes equipped to mount eight 3600 psi receivers. The cart comes standard with a nitrogen gas dryer and filtration system, which removes any moisture and particles in the nitrogen gas down to 5 microns. The 30 foot servicing hose is mounted in a storage box which has a separate compartment that can be used to store filling adapters. The 10 Bottle Nitrogen Cart is a towable source of nitrogen gas for servicing tires, struts, accumulators, and other gaseous nitrogen needs. The cart is equipped to service both high pressure (0-5000 psig) and low pressure (0-400 psig) servicing needs. The system has a two service gauges, a regulator, and service hose. The bottle cart comes equipped to mount ten 3600 psi receivers. 2200, 4500, 6000 and 10,000 psi receiver mountings are available as options. Other options include a Booster System, Self-Fill Option, Hose Reel, and Air Drive Option. The Booster System Option adds an air-driven gas booster to the bottle cart, which uses gas from the receivers to boost the nitrogen gas to high pressure. Even with receiver pressures as low as 500 psig, the cart can still deliver high pressure gas to 5000 psig. The Booster System option is available with many different booster ratios which can deliver pressures as high as 10,000 psig. The Self-Fill Option is only available with the Booster System. It allows filling of the on-board receivers from a low pressure nitrogen source, without removal, using the booster to do the work. The Air-Drive Option, which is also only available with the Booster System, allows the booster to be driven from an external low pressure air source, which conserves the nitrogen in the receivers.